Each year on the last day of November, my husband, son and I make our own advent calendar that has been passed down in our family for generations. 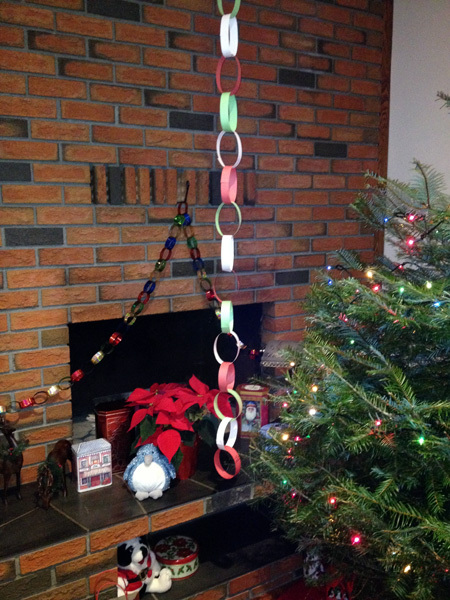 It is a colourful paper chain that we hang from the ceiling and use to count down the days until Christmas. One can be made for the whole family to share and hang in the main room of your home, or each child can make their own. I grew up with 3 siblings, so each of us had our own chain hanging by our bed. The materials you will need are: coloured construction paper, scissors, gluestick (stapler or white craft glue). Cut 24 strips of a mixed selection of red, white and green construction paper (or any colour combination desired). When the 9 x 12 paper is cut lengthwise, it makes a longer chain that will hang from ceiling to floor. Glue the strips in links, joining them together to make a chain. 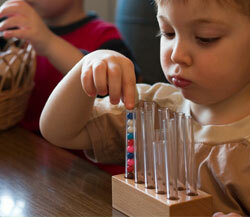 The method of connecting the strips might depend on the child’s age, and what tool he is most interested in learning to use. My husband and I began this ritual the year our son was born; at 2 1/2 years old he was helping to make the chain; at 5 he was making it on his own. Beginning on December 1st, each night at bedtime until the 24th, we remove one link of the chain. As the month progresses, the chain gets shorter and shorter, becoming a visual impression of the time remaining until Christmas eve and only one chain link is left. The paper chain invites the opportunity to count the links that are still hanging. It is also an indicator for how tall your child has grown as he becomes able to reach the higher links without a stool or his parents to lift him up. If you leave the torn links in a pile on the floor under the chain, you also create a visual impression of the difference in the number of days. This tradition of counting down the days until Christmas has been in our family for over 85 years. Blog Advent calendar, Seasonal. permalink.